Keep up to date on the latest happenings at Artis Senior Living by following our news articles here. Recent studies have shown a relationship between Alzheimer’s and dementia and how healthy habits can not only boost your brain health but improve your daily life. Here at Artis Senior Living, we believe that an active, social, and healthy lifestyle could have a big impact on aging stages, which is why we’re sharing these five lifestyle choices that could help you reduce the risk of dementia and live a better life. We are still learning about ways to help prevent dementia from progressing, but one thing we’re sure of is that exercising on a regular basis will help keep your body and mind active. Challenging not only your body but your brain is key to healthy aging. While some doctors recommend exercising regularly at a high intensity, we believe that any activity that gets you moving, whether it’s swimming, a short walk, or light yoga, is a smart choice for you and your health. A healthy and balanced diet will help keep your weight, blood pressure, and cholesterol levels in check. It’ll also help boost your energy. These are important factors to monitor when it comes to helping prevent dementia. Most doctors recommend a Mediterranean diet, which includes more fruits, vegetables, and nuts while consuming less meat and cheese. Not only are we used to hearing about the benefits of having a glass of red wine once per day, research suggests that drinking in moderation can help your brain clear away toxins, and it may even slow the progression of Alzheimer’s. Mayo Clinic has a great blog post about how you can improve your daily diet in very easy ways like enjoying a cup of tea. In relation to the previous point, getting your blood tested periodically is important in detecting diseases and helping prevent complications. Early diagnosis can help slow the progression of dementia. It also gives you more time to plan for the future. The Alzheimer’s Association has very important and useful information about periodic checks and the benefits of early diagnosis. While this may sound like a tall task, there are simple activities that can help keep our life as stress-free as possible. Quality, uninterrupted sleep is something we take for granted but is highly beneficial. We often fill our agenda with meetings, appointments, and to-dos, but scheduling fun and relaxing activities are important for your lifestyle and your health. According to the Alzheimer’s Society, while stress is difficult to study, new research shows that it could play a major role in memory loss, even though is not the only factor. 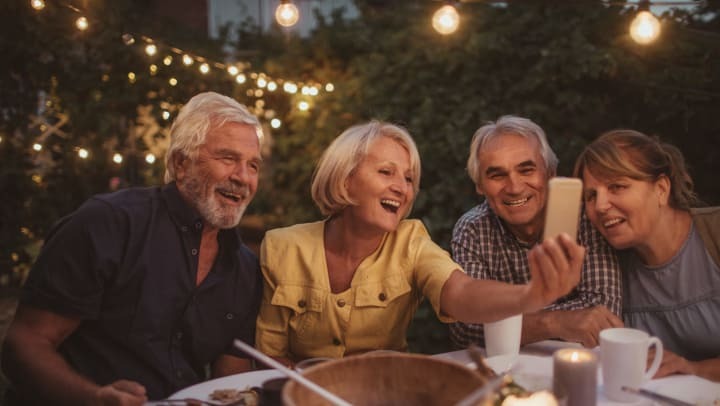 Last but not least, maintaining an active social life is one of the best things you can do for your present and your future – and for preventing diseases like Alzheimer’s. Staying active, maintaining your sense of humor, making an effort to regularly get together with friends and family, meeting new people, and getting out of your comfort zone, are just a few of the ways to help you live a healthy and happy life. At Artis Senior Living, we accompany you and your loved one on this journey. We believe that medical support is as important as emotional and social connection. Give us a call to discover the Artis Way.